Do you have a caravan reversing camera or sensors? Reversing and moving your tourer into a tight spot on site, in storage or at home can often be a challenge and sometimes lead to an unwanted knock or scrape! Not only will having a caravan reversing camera help you to reverse like a pro – it can help to keep your caravan insurance premium down too. 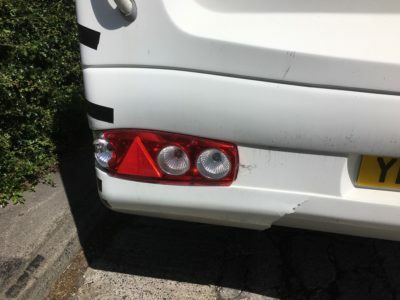 We regularly deal with caravan insurance claims for accidental damage caused by a reversing mishap and it’s likely that some could be avoided if the tourer was fitted with a reversing camera or sensors. It’s pleasing to see some manufacturers now fitting reversing cameras as standard to larger caravans, which will give owners a discount on their caravan insurance with Caravan Guard. In our latest community poll, we’d like to know if you have a reversing camera or sensors fitted to your caravan? And if not, would you consider having either fitted? Click on one of the options below and then hit vote. We’d also love to hear your caravan reversing tales and if a camera or sensors have helped to prevent any damage to your beloved tourer when carrying out a tricky manoeuvre. Simply add your comments in the box below. I not only have a camera mounted on the rear of the caravan which is wired into a 7″ screen I also use it for a rear view mirror ideal for pulling back in when overtaking. I can see ever thing at the rear of the caravan all the time a lot better than just with the door mirrors. Sounds like a great piece of kit Tony. I have a rear view camera (used when towing and reversing). Image is relayed via bluetooth to screen (Garmin) on dashboard. Colour image (though colours have slightly purple tinge), and superb wide angle. Good visibility at night. Fitted by specialist company prior to collection from dealer it springs into life once the electrics are connected between car and caravan. Screen in car powered from power socket Cigarette lighter). Find it excellent for both towing and reversing onto pitch. I have a reversing twin lens camera it’s brilliant l wouldn’t be without it. The original camera on my rapido motorhome was rubbish. This one gives a view when reversing you can see down the back of the van when parking, and the other lens gives a view of traffic. That sounds great David. We offer a caravan insurance discount for reversing cameras. 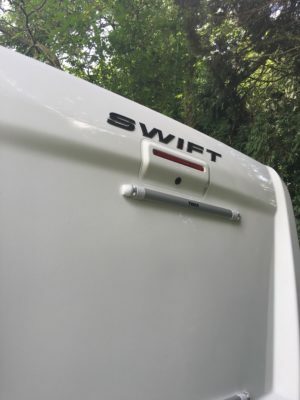 I have one fitted as standard on my new Swift Elegance (2017 model). I was hoping it would be of use when towing on the open road but it is angled purely for reversing onto pitch etc. Have only used it the once so far. Could be improved drastically by having a colour camera with better definition but in time I’ll probably get used to it. Good conceptual idea but IMHO needs refinement and improving. Thanks Alan. Sounds like you’ve got a bargain there with your reversing camera. Great that it works all the time so is useful when towing. Yes I have fitted a rear view camera and when connected its on all the time its in colour and has night vision and it lets me see if any one is coming up behind me or are to close to see in the mirrors if I wont to overtake,it keeps my co- pilot ( the Wife ) happy as she was looking in the mirror all the time before, I got the camera and monitor and cables with screw ends from Ebay I think in all with the extra strong magnets which Glued to the back so I did not have to leave the camera attached when not wanted came to £105,00. I have a Swift caravan with a reversing camera as shown in your picture. First the picture quality is poor very poor. I normally use my mover for reversing, so the car is not connected . In fact i feel quite disappointed as I had hoped to be able to use the camera not to reverse but as a rear view aid whilst driving but this is not possible either. What we use is a walkie talkie on the dash, and my wife guiding me back with the other walkie talkie. A good alternative to a reversing camera David!